Hybrid Warfare Analytical Group of UCMC has released a new research – “How Russian media foments hostility towards the West”. Unlike the previous study which was about Europe, this one is mainly about the US. 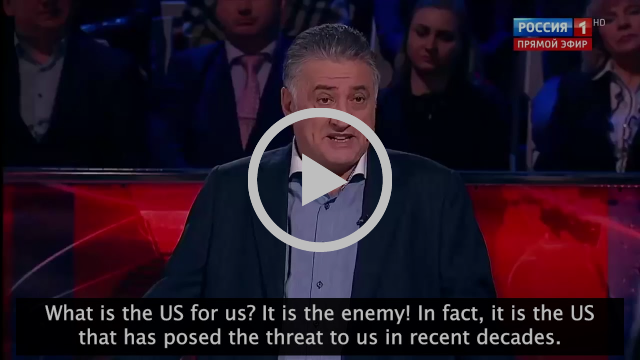 and NATO as the main US force in Europe.This research is studying the methods, instruments, and messages utilized and conveyed by Russian mass media in order to produce Threat Narratives about the West for Russian domestic audience. We believe that Russian domestic audience is of greatest importance to Kremlin, thus it is crucial to understand how Moscow works to seize and hold the attention of its subjects. The research is based on quantitative content analysis with the analytical part written by the experts in the field of Russian propaganda. The quantitative part of the research covers the period of July 1, 2014 – December 31, 2017. The raw data consisted of all news broadcasts and selected political talk- shows on the top three Russian TV channels, and news articles on 10 popular websites. This data has been converted into text format, which was then transformed into a database. Our conclusions are based on roughly 574,000 news pieces. The center is located in the hotel Ukraina (4 Instytutska Street), 3rd floor. Hotline +38 050 157 8159, +38 050 157 8423, fax +38 044 593 7407, e-mail press@uacrisis.org. Ukraine Crisis Media Centre was set up in March 2014 to provide the international community with objective information about events in Ukraine and threats to national security, particularly in the military, political, economic, energy and humanitarian spheres. The Centre is providing media support o a 24/7 basis to all those covering events in Ukraine and runs a daily schedule of live press briefings and moderated discussions to provide the world with accurate and up-to-date information about the fast-moving situation in Ukraine. Since inception, the Center has evolved into a communications hub with outreach to both internal audiences in Ukraine as well as conducting active outreach to opinion formers and the media outside of Ukraine.